It's hard to believe that Buffy the Vampire Slayer is 20 years old — but it's true! That's when the show turns the trope upside-down, neatly subverting it. The girl's face changes, her fangs come out, and the guy she's with becomes her lunch. In that one establishing scene, Buffy let us know what we were in for: a series that understands all the tropes, and will go to any length to subvert them. From there, we spin away to a nightmare in which our protagonist, Buffy Summers, is struggling with nightmares of the evils that plague Sunnydale. Normally, dramatic fiction like this ends with the dreamer awakening, sitting bolt upright in bed, and possibly even screaming. In "Welcome to the Hellmouth", Buffy simply opens her eyes. This subversion's pretty important; it immediately hints that Buffy is no mere 'damsel in distress', overwhelmed by the horrors around her. This is a female star unlike any we've seen in horror shows before. Of course, Buffy herself is a subverted trope (and so much more besides). Head to classic horror films, and time and again you'll beautiful blondes who only exist to run screaming down alleyways, waiting to be saved by a handsome hero, or meet a sticky end. But the world of Buffy is a very different one. In this world, it's the women who have the power to stop the bad guys — Xander becomes the 'damsel in distress' more often than any other character. In Buffy, the beautiful blonde is the hero. She's the one who runs into the shadows in pursuit of evil; she's the one who stands against the forces of darkness. This single decision pretty much turns the entire series into a subversion of the horror genre, and that's one of the reasons Buffy's legacy has endured. Trope-subversion is also at the heart of two defining moments for Buffy Summer; the nights she died. 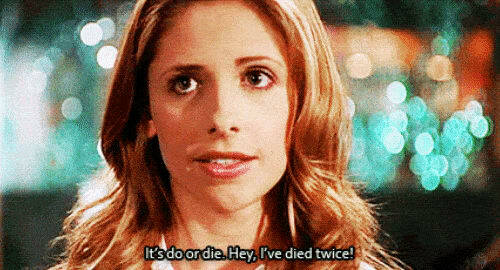 Buffy's first death was in the episode "Prophecy Girl", which brought the twelve-episode first season to a dramatic end. This first season had acted as a midseason replacement for Savannah, so Buffy's future was far from certain at the time. All twelve episodes had been filmed before "Welcome to the Hellmouth" had even aired, and nobody had any idea how the public would respond to this strange, whimsical show. So "Prophecy Girl" is a perfect season end, drawing all the threads together in dramatic fashion. By halfway through "Prophecy Girl", Buffy is defeated and killed by the Master. That's where the subversion begins; normally in a show like Buffy, resurrection is a matter of sorcery and the supernatural. Not this time round; Xander stumbles across Buffy's body, and gives her CPR! Buffy's second death is at the end of Season 5, when she sacrifices herself in order to save her sister, Dawn. Season 6 begins with the Scooby Gang taking advantage of Willow's magic in order to resurrect her, convinced that her soul could be trapped in an unspeakable Hell dimension. In a fantastic subversion, though, Buffy isn't shown celebrating her resurrection; she struggles painfully to acclimatize to the real world, and we gradually learn why. As she finally reveals to the Scoobies in the classic 'Once More With Feeling', Buffy wasn't in Hell at all — she was in Heaven, a place of peace, with no pain and no suffering. They stole her out of Heaven. It's a heart-wrenching twist, a subversion of so many mythological resurrection stories, and a poignant warning about the need to let go. Now let's focus in on one of the best episodes of Buffy, Season 4's 'Hush'. 'Hush' explores the most basic horror trope of them all: that moment when the hero hears a scream and runs head-first into danger. The scream is the inciting incident, the 'call to action', driving the hero into the events of the episode or movie. In "Hush", though, the Gentlemen strip the whole town of Sunnydale of the power of speech. In Sunnydale, no-one can hear you scream. It was actually Joss Whedon's attempt to subvert his own show. Buffy was getting high praise for its dialogue, so he decided to do an episode with as little dialogue as possible. Even better, as the episode continues, you get subversion after subversion. Buffy and Riley communicate more freely and openly when robbed of the power of speech than they have for all of the season so far, while Giles gets a brilliant 'lecture explanation' scene. Unable to speak, he instead sketches images on a projector screen, and so another common Buffy trope is subverted. Fittingly, 'Hush' ends with the power of speech restored, and with Buffy's scream destroying Gentlemen. This inventive episode transforms the scream itself into the weapon that destroys the threat. As you can see, Buffy the Vampire Slayer thrived on the idea of subversion. The very first episode subverted the horror genre in its opening scenes, and from that point on the series reveled in its habit of taking a common trope and turning it upside-down. I've only highlighted a couple of classic examples here, but Buffy the Vampire Slayer will always stand as the ultimate genre-savvy show.